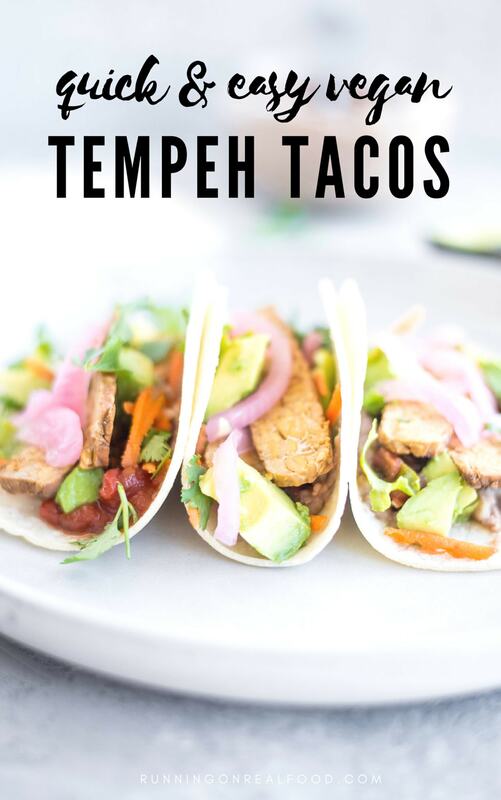 I made these vegan tempeh tacos on a camping trip and they were so easy and tasty I decided to share them on the blog. 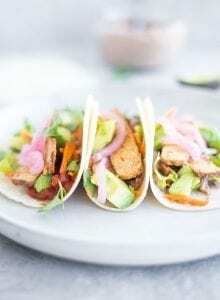 These tacos aren’t fancy but despite their simplicity they’re incredibly delicious and really hit the spot when you want a quick and easy dinner that doesn’t skimp on taste. As for sauces, for everyday tacos I usually don’t add anything besides salsa but you could to do quick tofu sour cream, cashew sour cream, avocado lime sauce, chipotle sauce or homemade taco sauce. For these tempeh tacos we’re keeping it simple though, so no sauce needed. They taste great with just avocado and salsa! You can use store-bought refried beans of course but lately I’ve been making my own refried beans from canned pinto beans. They’re easy to make, taste great and you get to decide exactly what goes in them. I use store-bought too sometimes. Just watch that they’re vegetarian refried beans as some brands use animal lard. I like pinto beans best for homemade refried beans. You can use black beans too but I find pinto beans softer and creamier and just work better. 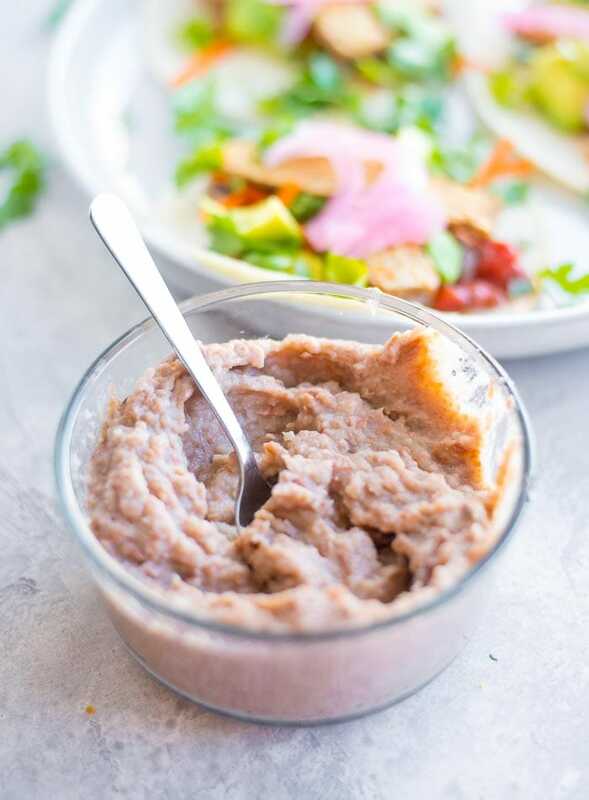 To make homemade refried beans for this recipe, you’ll need onion, salt, garlic, chili powder, cumin, 1 can of pinto beans and some water. Cook the onions and salt in a saucepan with a splash of water until the onions are soft, about 5-10 minutes. Stir in the garlic and spices and cook another minute or so then add the beans and water. Cover and let that cook for another 5 minutes or so, then turn off the heat and mash the beans with a masher or fork until you reach your desired consistency. I like them really smooth so I use my immersion blender right in the pot. You can also use a food processor but I don’t like making the extra mess. If they seem to dry, just add a bit of extra water. Lastly, stir in a squeeze of fresh lime juice. For spicy refried beans, either add 1/2 a minced jalapeno with with the onions or a good pinch of red pepper flakes with the spices. These tacos are really nothing fancy. 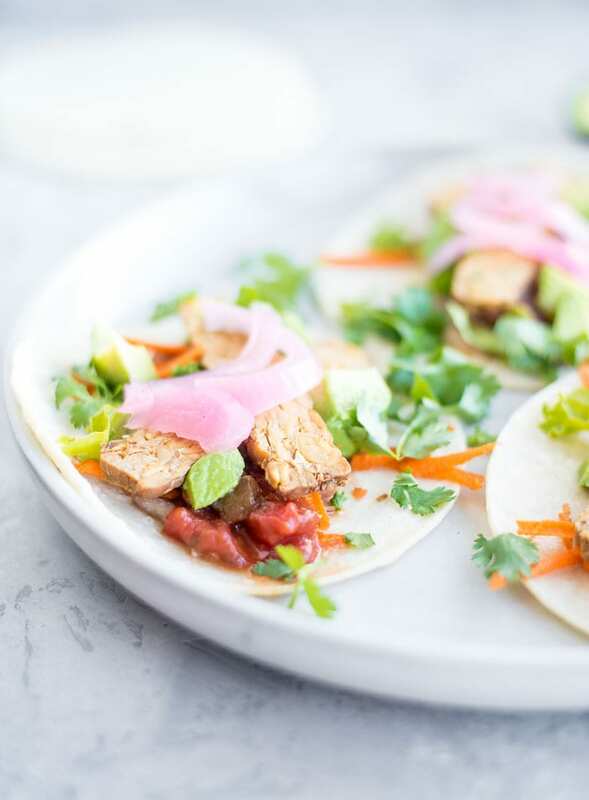 All you need to do is heat some tempeh and stick it in a tortilla with your favourite toppings. If you’re looking for a protein-rich, easy and healthy plant-based meal though, this just might be it. Unfamiliar with tempeh? Tempeh is made from fermented soybeans and is one of my favourite vegan protein sources. For more on exactly what tempeh is and how to use it, check out my guide to tofu and tempeh. I used store-bought tempeh for this recipe, cut into strips. To prepare it for the recipe, just lay the strips in a good non-stick pan stovetop and cook until brown and crispy. You can also bake it at 400 F until browned. You can also try it in my Brown Rice and Baked Tempeh Bowls or Tempeh Quinoa Macro Bowl. For more Mexican-inspired recipes, try my Vegan Quinoa Fiesta Salad, Vegan Burrito Bowls with Chimmichurri Sauce, Vegan Black Bean Burritos with Red Rice, Healthy Vegan Lentil Tacos and Vegan Breakfast Burrito Bowl with Chipotle Sauce. 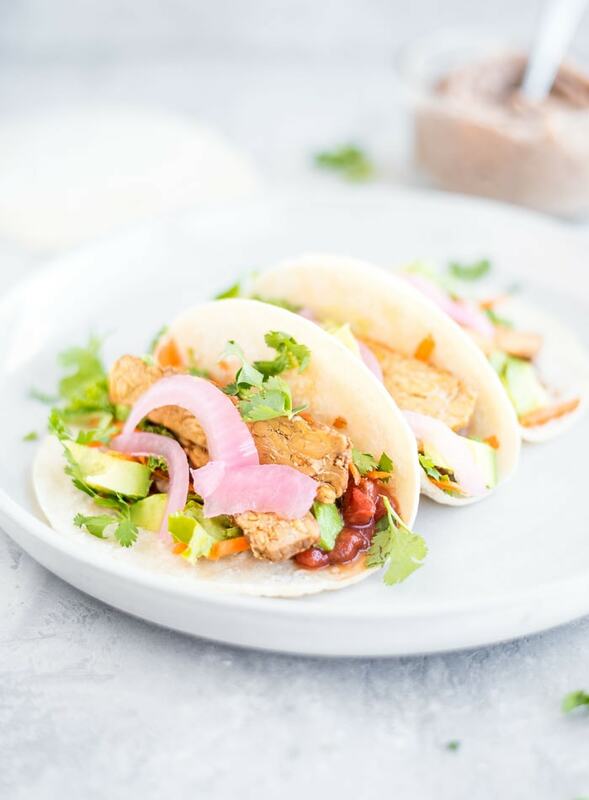 Easy, simple tempeh tacos that can be customized to your liking. 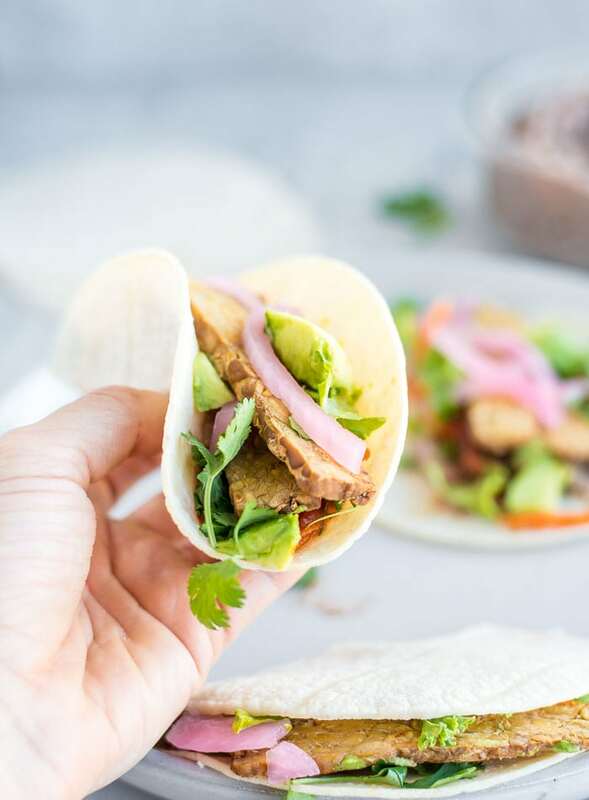 Tempeh is rich in protein and nutrients and when crisped and browned in a pan, works perfectly in these vegan tacos. To make the tempeh, lay the strips in a non-stick pan and “dry-fry” over medium-high heat until browned and crispy. Heat the tortillas in the oven, microwave or stovetop in a pan. To make the tacos, start by spreading some refried beans over each tortilla then smashing the avocado over that (better avocado distribution…yum), then top with salsa, grated carrot, lettuce. 2 strips of tempeh )per taco), cilantro and lime. Yum! I have been craving tacos for the longest time and these look incredible! I’ve had trouble finding tempeh in the UK so I’ll have to stick with tofu for now haha. PS. your photos are gorgeous! Oh, thanks!! Tofu would be good too! Hope you enjoy them.